WVU fans take in a game at Mountaineer Field, Milan Puskar Stadium, in Morgantown in northern West Virginia. While we at West Virginia Explorer tend to focus on the natural attractions and landmarks that define West Virginia, it’s hard to deny the excitement that surrounds the college football season here each fall. Over the years, West Virginia University’s Mountaineer Football has established a reputation as a consistently competitive program and one that tends to play a particularly exciting brand of football. If you’re intrigued, not just for the sport but for the atmosphere and what’s ultimately a thrilling cultural experience tied to the state, read on for a few specifics on West Virginia University (WVU) football in general and what to expect from the 2018 team experience. The West Virginia University football stadium is a beautiful place to watch the sport and one that’s perfectly dedicated to the spirit of West Virginia. As a review of the stadium put it, there’s only one college football stadium in the nation where you’ll hear John Denver’s “Take Me Home, Country Roads” and see a mascot in a coonskin hat with a frontier-era rifle. 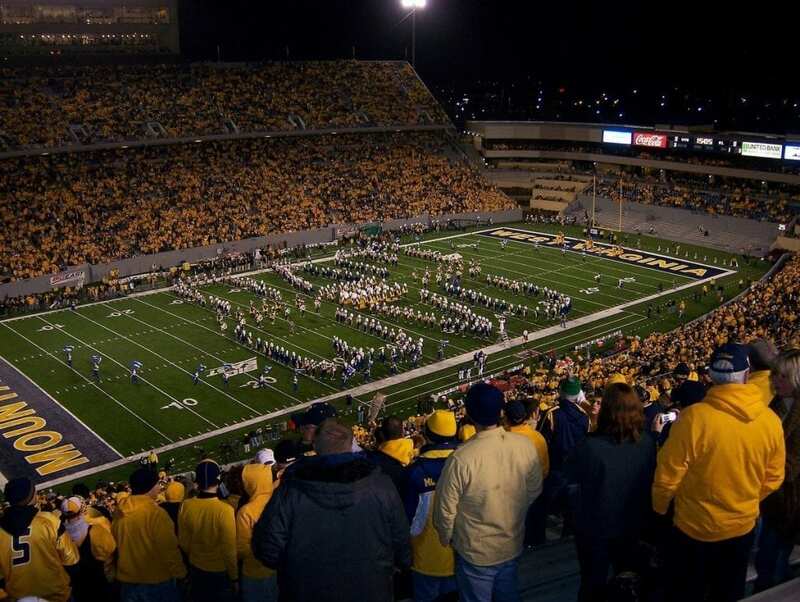 The stadium is located in the hills of Morgantown, and rather than being just another venue for football, it celebrates—almost without effort—the unique and vaguely secluded culture of the state and Appalachian region. Through the mid-2000s, with the exception of a few strong seasons (such as 11-1 campaigns in 1993 and 1988), WVU’s was a fairly average football program. Since the hiring of head coach Rich Rodriguez in 2001 however, the program has risen to new heights. Since Rodriguez’s first, there’s been only one losing season through his own tenure and those of his successors Bill Stewart and current head coach Dana Holgorsen. There have been 15 bowl-game appearances in that stretch of 18 seasons, and the Mountaineers have been a fixture in the national rankings. The idea of the program’s deep tradition is conveyed in part by the stadium, as described above. However, there’s more to the school’s football tradition that furthers the degree to which the program feels unique. The sports publication Bleacher Report did a great job summing up this tradition in a piece about the ways in which you know you’re a Mountaineer football fan. They highlighted the rivalry with Pittsburgh, “Let’s go, Mountaineers!” chant that rings through the stadium, dressing in blue and gold, and students burning couches in celebration. In early autumn there isn’t much crossover NFL/college football speculation. Even at sites that will eventually list NFL Draft projections and odds, the focus right now is on the season ahead, and early versions of Super Bowl speculation. It’s a good bet however that when we do start seeing NFL news as relates to the next incoming crop of college players, university quarterback Will Grier will be mentioned frequently. The 23-year-old senior who transferred from the University of Florida is a bona fide star, who could be in talks for the Heisman Trophy and may be the top QB taken in the next NFL Draft. This should add some additional excitement to the current season. As mentioned, West Virginia is on quite a streak of bowl contention, having found itself in the post-season just about this entire century. The 2018 team should be no different, and could in fact be in talks for some of the bigger bowl games in the country. That will be exciting when it happens, but it also makes the whole season more interesting.